We are Ladies with Hattitude!!! if you would like more details or a friendly chat and for further information. 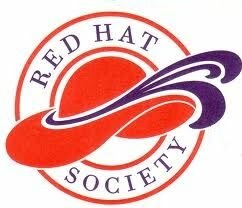 We are an official chapter of the Red Hat Society, membership no 84378.
countryside around the City of Chichester. We are a friendly group of young at heart ladies, who want to have fun and enjoy life, to make new friends like getting together for dinner, outings, theatre, sightseeing, entertainment, concerts, holidays and much much more. Most of our outings are group led so ideas and suggestions from members are always welcome. We meet once or twice a month for a regular Hat 'n Chat in Chichester, were we welcome visitors or prospective new members to come along without obligation, to look us over to see if you like us and to find out more about the things we do and the places we go. If you see us out and about do come over to say 'Hello' we are friendly and fun. There is only one rule for members of the Red Hat Society, that is when we meet and go out together as a group, we wear a Red Hat or Fascinator with a Purple Top. Sometimes we add some feathers bling or sparkles as most of us like to dress up. We understand it can take a little time to make a wardrobe of red and purple so we can lend you a hat to start with, then you can choose a regal 'nom de chapeau' something personal and fun. with a Red dress for an event or for the entire month, if you wish. 50th Birthday, which calls for a special Red Hat celebration!! other’s needs – is very appealing. And satin sandals and say we’ve no money for butter. In 1998 Sue Ellen Cooper, an American lady framed a copy of the above poem and gave it to her friend, together with a red hat as a 50th birthday present. This friend copied the idea when her friend had a birthday etc. etc. Before long these friends found that they were a club of ladies who were practising how to grow old dis-gracefully. All members pay a small annual membership fee. This is should be paid within the first month of joining and renewed before the end of December each year. We are a non profit making organisation, the funds are held in a separate account and used towards expenses and events as agreed by all the members. All outings, theatre trips and events are taken at your own risk we are not responsible priced and must be paid for in advance by the individuals attending. Sometimes a non refundable deposit is required to secure places. We use group save tickets or discounts whenever possible. As a distinctive group of ladies we are often photographed by members of the public which we have no control over. Group photos may end up on this and other websites - you are free to not participate in a photo if you prefer.